“Someone jolted my elbow as I drank and said, ‘Je vous demande pardon,’ and as I moved to give him space he turned and stared at me and I at him, and I realized, with a strange sense of shock and fear and nausea all combined, that his face and voice were known to me too well. I find it amusing when I come across a perfume that reminds me of another one that I know. I’m talking not about a vague resemblance, a couple of common notes or a recognizable designer’s accord, but the situation when two completely unrelated fragrances smell so similar that I would have had a hard time telling them apart were they not compared side by side. There is no practical use for these discoveries. But even though I remind myself of Joey from the Friends episode in Las Vegas where he gets excited about finding his “identical hand twin”, I can’t help discussing these resemblances with friends, colleagues and other unsuspected victims. So probably having an outlet in my blog for this weakness of mine is the lesser of evils. During a very successful Christmas shopping and perfume counters scouting last December my girlfriends and I found ourselves on a desolate floor of Barney’s. Two guys in the fragrance department were very helpful and attentive. Too attentive. I really dislike when sales associates hover over you watching your every move. I don’t know if it works on anybody but on me it doesn’t. I cannot be bullied into buying anything before I’m ready. Even with two of them faithfully trying to catch my eye after each sniff. By the time we moved onto Frederic Malle’s section they’d probably realized that as well as the fact that they were outnumbered (there were three of us). So they proudly announced that we were in luck because there just happened to be a FM’s Specialist in the house. She appeared and under her watchful eye we tried several perfumes but there were too many words, too many bottles and too much pressure so I decided that it was worth paying money for samples online. But the last one I tried suddenly attracted my attention. “I like this one” – I told to my friends handing over a blotter. “Of course you like it!” – immediately responded one of them, – “It smells like Tuscany per Donna which you also like”. And she was right: it did strongly resembled TPD as I remembered it. I was so thrilled by that discovery that I just had to share it with the Specialist. You could tell how indignant she felt about my comparison of the Pierre Bourdon’s masterpiece to some perfume she didn’t even recognize (mentioning Estee Lauder didn’t help). Either she was eager to prove me wrong or just wanted to stop the torture but she agreed to make me a sample of Iris Poudre – so that I could compare it at home to that other perfume. I did. On more than one occasion. Since then I’ve bought 10 ml travel spray of Iris Poudre – because I like the perfume and because I wanted to compare a spray to a spray. I still think that during many stages of their development on my skin they smell a lot alike. I know that official notes listings do not mean much but for what it’s worth, out of eleven notes listed for the Lauder’s perfume only three are not present in Malle’s one (honeysuckle, Mediterranean herbs and peony), seven notes are identical (amber, carnation, jasmine, lily of the valley, rose, sandalwood and vanilla) and one note is in question (not specified citrus in TPD versus bergamot and orange in IP). Iris Poudre has extra ten notes listed. These two are not identical and have stages when I like one of them better than the other. 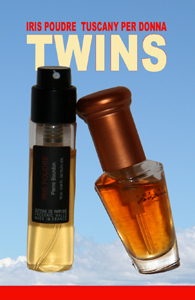 But as far as my olfactory abilities go Tuscany per Donna and Iris Poudre are twins. A curious fact: Luca Turin (who is not always right but still) in the Book gave Tuscuny per Donna ****. Iris Poudre got just ***. So that SA was snobbish for nothing. I’m not alone in this quest. Muse in wooden shoes found another relative of Iris Poudre. For a real review for Iris Poudre read: Olfactoria’s Travels. I couldn’t find a good review for Tuscany per Donna, so here’s a link to the page 343 from Luca Turin’s Perfumes: the Guide where he writes about this perfume. This entry was posted in Acquaintance with letters, Déjà vu, Favorite Perfumes, Not a Review and tagged Estee Lauder, Frederic Malle, Iris Poudre, Luca Turin, Tuscany per Donna. Bookmark the permalink.